NB This guide assumes you have already made a beautiful piece of audio for which you own all the rights and copyright. 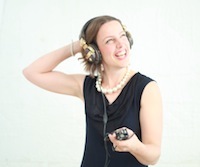 If you want help creating your audio, please contact me to book in a production or audio coaching package! 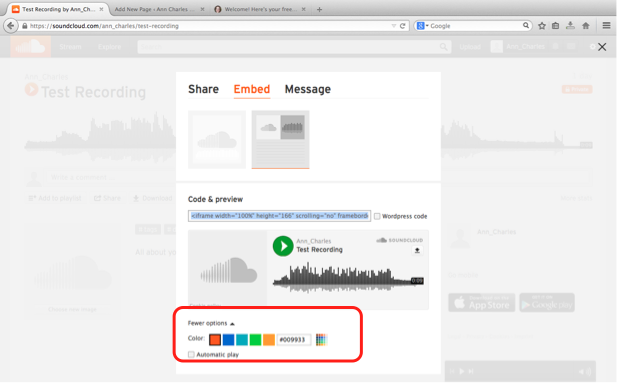 So you have created your beautiful piece of audio and now you want to share it as a free gift for people signing up to your email list. But – how do you do that? This guide takes you through the process, step-by-step. 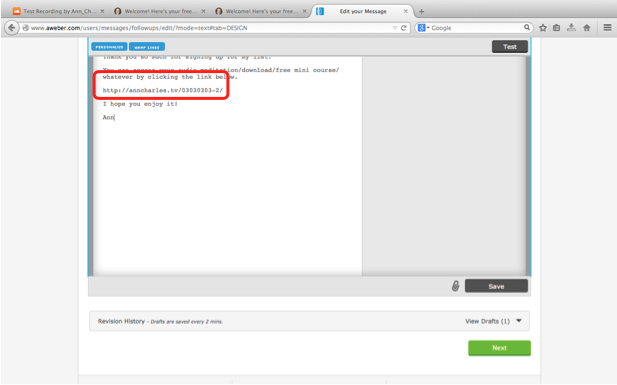 It assumes that you already have either an Aweber or MailChimp account. You don’t want to host the audio on your own site, as if it becomes very popular, the audio could cause your website to slow down or even crash! 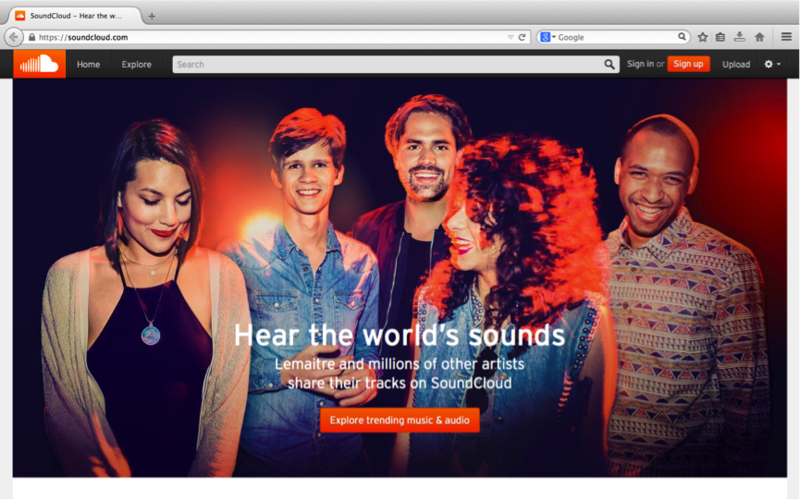 So we’re going to use an external company called Soundcloud to host your audio (there are other companies out there, so search around if Soundcloud’s not the right fit for you). 1a. 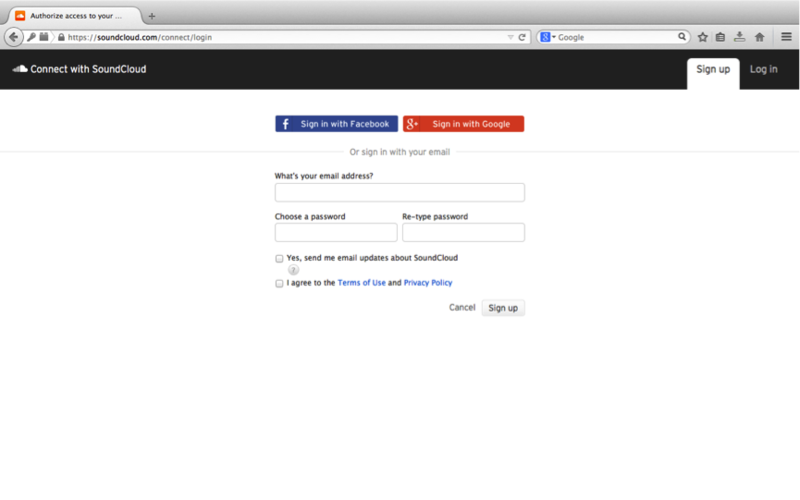 Go to Soundcloud and create your account. Don’t forget to confirm your email address when prompted, or the next step won’t work. 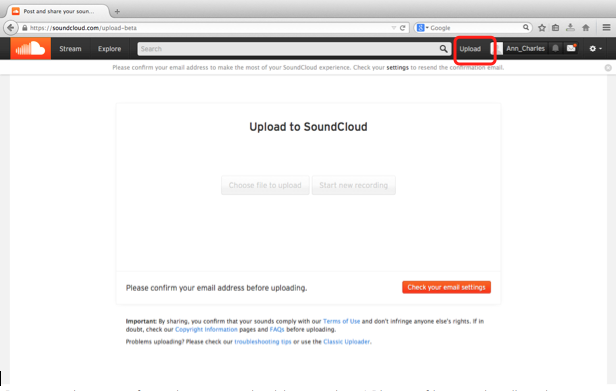 Once you have confirmed your email address, select ‘Choose file to upload’ and then search for your audio file on your computer. It’s a good idea to save it as an MP3 file as it will take up less space and be easier for people to listen to on their portable music devices. 1c. Now we’re going to customise the display so people know what they are hearing. 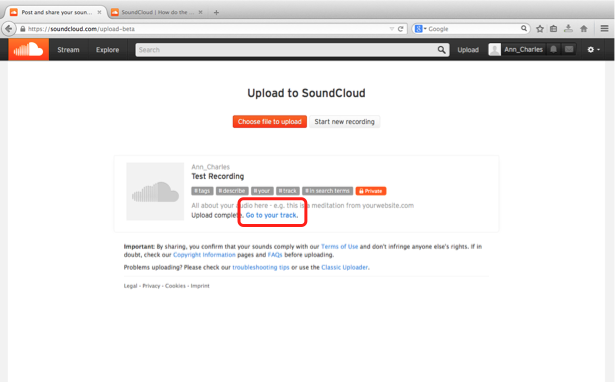 Create a title – make sure it is something that says what the audio is. E.g. ‘Miracle attraction meditation from yourname dot com’. If you want anybody to find it, you can add some tags. If it is just for your subscribers, you can leave this bit blank. The description box lets you add a bit more information. 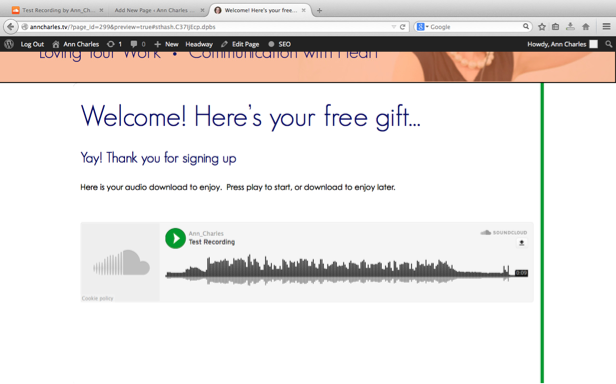 If you want this gift to be just for people who sign up, make sure you click the ‘private’ button. 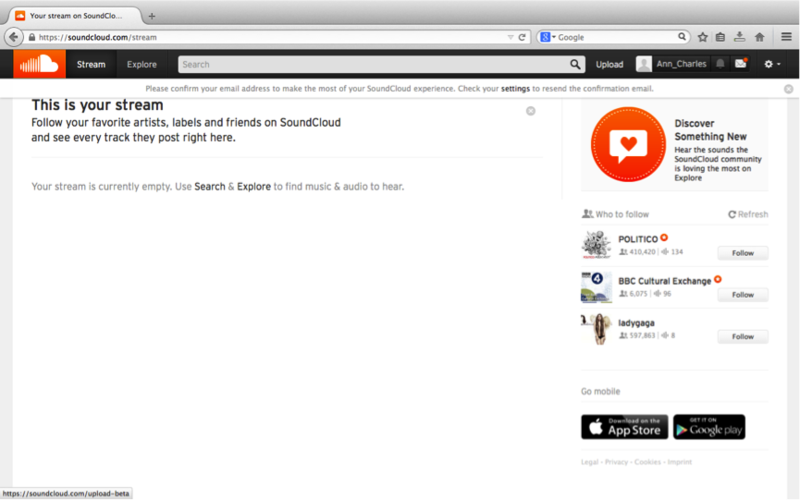 ‘Public’ files can be found and played by anyone on Soundcloud. 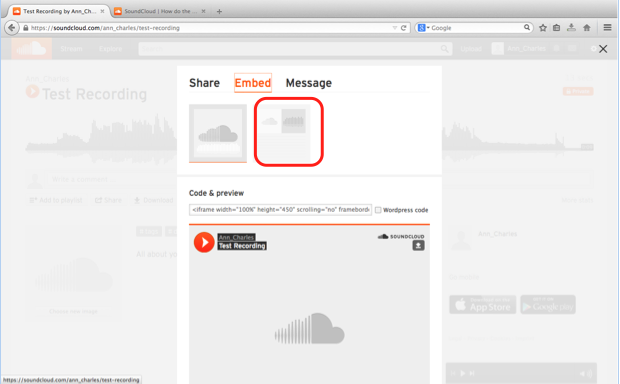 You can also upload an image to go with the audio. Square pictures or logos work the best. Now click on the ‘Permissions’ tab and tick the ‘Enable app playback’ and ‘Display Embed code’ buttons if they aren’t already ticked. You should also tick ‘Enable downloads’ if you want people to be able to save the file to their own computer or MP3 player to enjoy later (if you don’t, they’ll only be able to stream the track online). Don’t forget to click the ‘Save’ button in the bottom right-hand corner! 1d. From here, it’s time to make a player that can go onto a special thank you page on your website. Click on ‘Go to your track’. 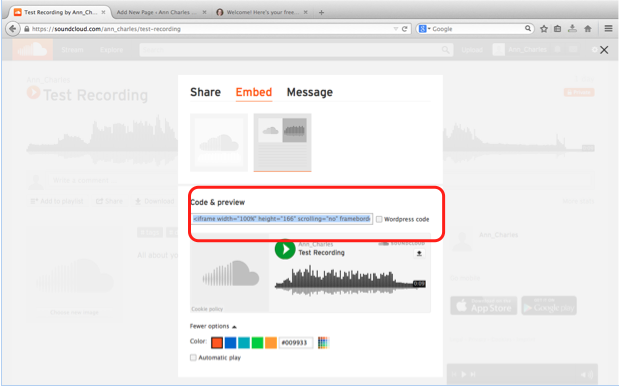 Do not be tempted to copy the code just yet – you need to click the ‘Embed’ option, first. Click the rectangular option at the top. Scroll down and click the ‘More options’ box to open up a colour coder. You can either leave this to the default option, or add in a colour that matches your site branding. Leave the ‘Automatic play’ box blank. Once you’ve done this, copy the code in the ‘Code & preview’ box. 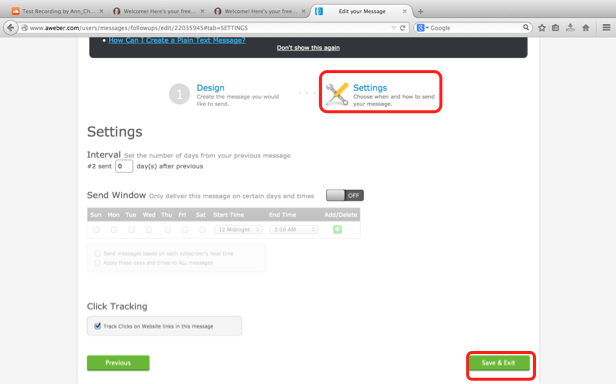 Don’t tick the WordPress code option (even though it might feel like you should). You’ll know you’ve got the right code because it will start ‘<iframe….’. Login to your website, create a new page and write some copy. 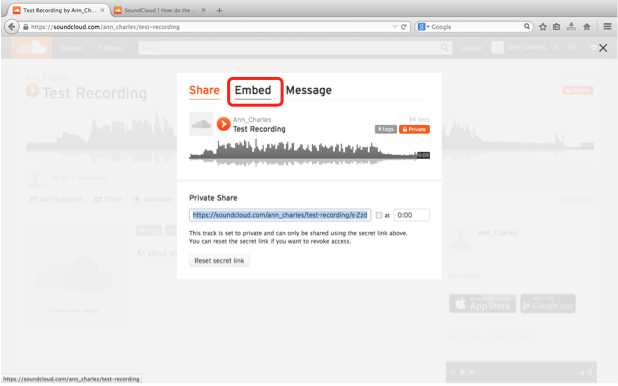 If you have the option to download the audio, it’s a good idea to signpost that to your reader in your text. 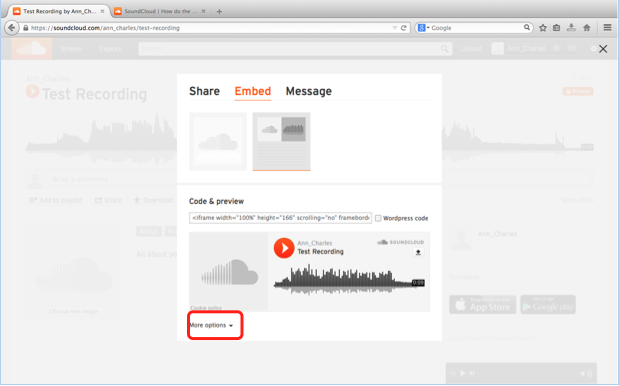 Click the ‘text’ tab and paste in your code from Soundcloud. Go back to the ‘Visual’ tab and you should see a grey box in the page. Press preview to check it’s all looking as you expect (and tweak it if not). 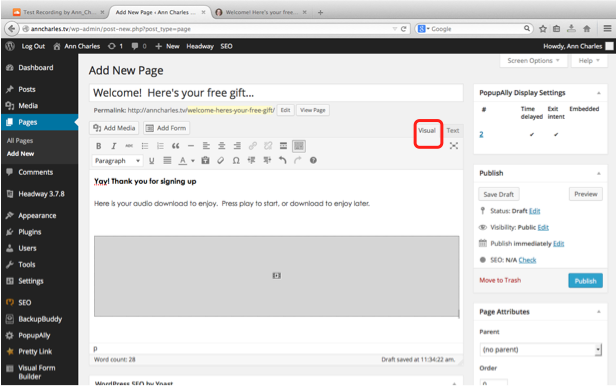 When ready, publish the page and copy the page’s URL to your clipboard. 3. Almost there! Now you need to go into Aweber or Mailchimp and make sure the link is in your welcome message (the first email your reader gets when they have signed up). 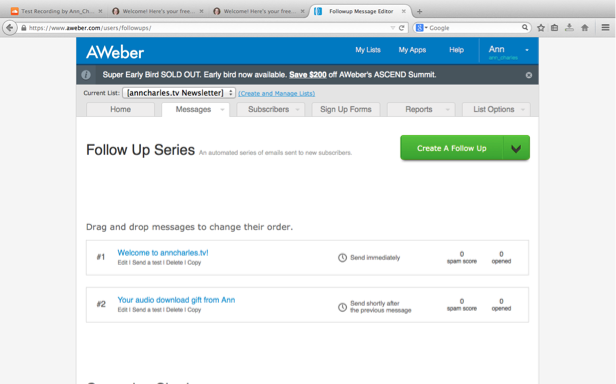 Log into your Aweber account and go to the ‘Messages’ tab and select the ‘Follow Up Series’. 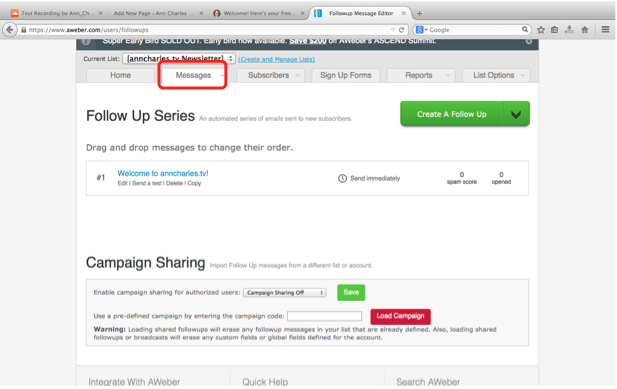 Either edit your welcome message, or create a new message in the ‘Follow Up Series’ area. 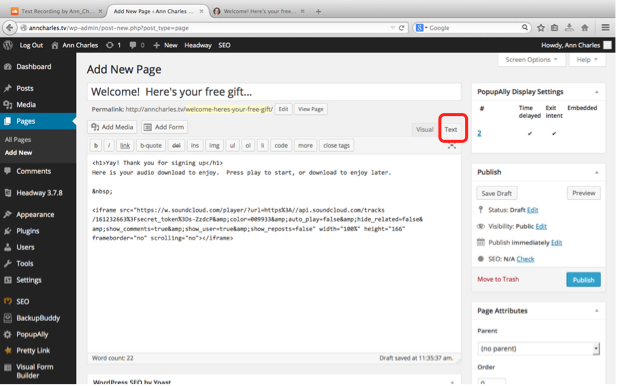 Make sure you paste your new page’s URL somewhere into the text. 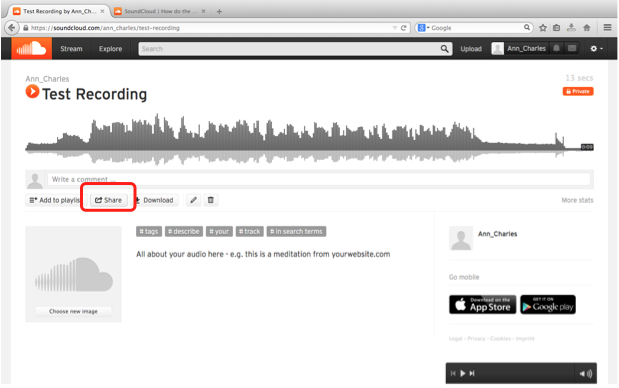 NB This is the address of the page you’ve just made and published, not the Soundcloud embed code! Once you have finished the design, click on the settings option at the top of the page to ensure the email is sent as soon as somebody signs up (the default is 999 days, which is a long time to wait). 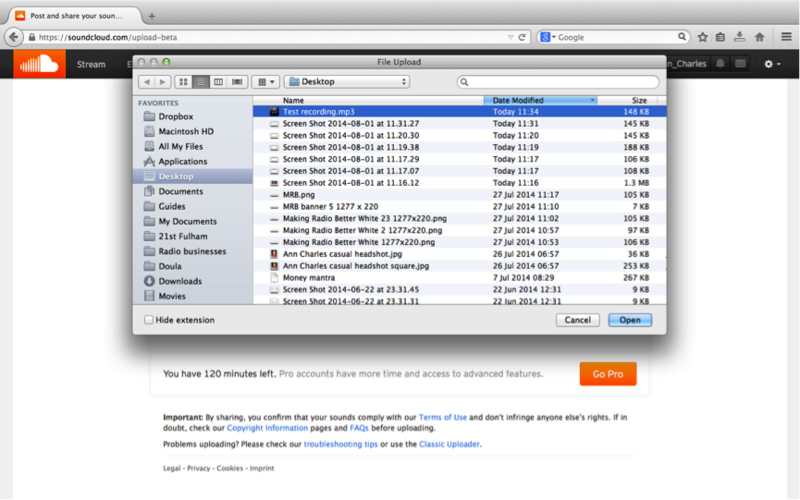 Test and tweak as you need! 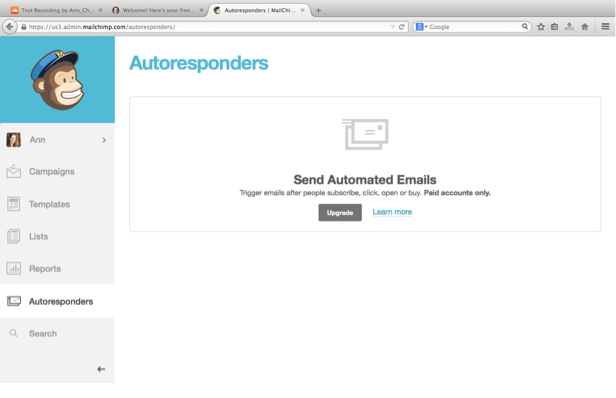 You need to create a new email in the ‘Autoresponders’ section. 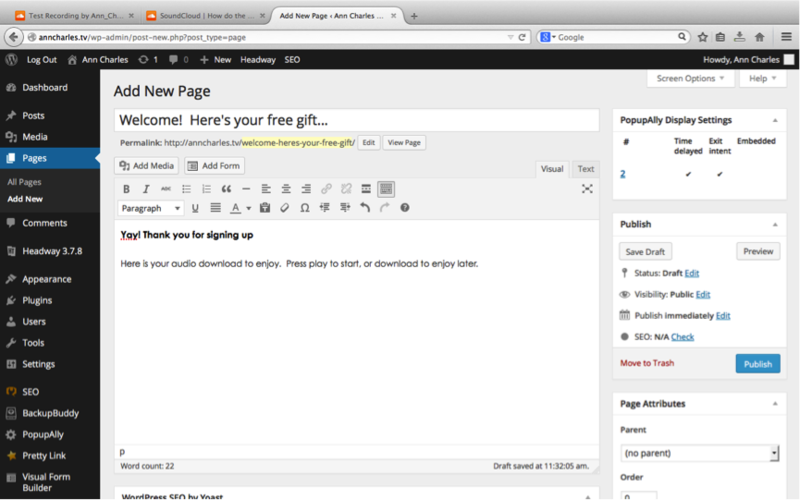 This is not available on the free account (I only have a free Mailchimp account to show you). 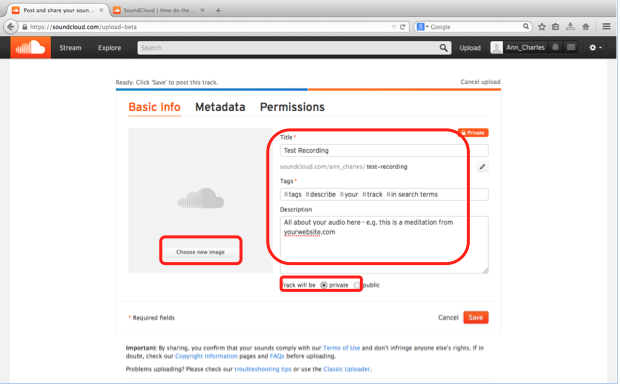 However, it will work in a similar way to Aweber – create or edit the first email your subscriber gets when they sign up, paste in the URL of the page you have just created with your audio download in it, do a quick test and then off you go! 4. The final step is to test the process – sign up as a new user and make sure all the steps work as you expect. If it does – you’re done! (If not, check with your autoresponder company’s help section for further info). 7. Have a cup of tea and congratulate yourself! Let’s keep in touch – please sign up for updates in the box below and if you need one-on-one audio help, production, or coaching, please contact me for one of my premium packages. 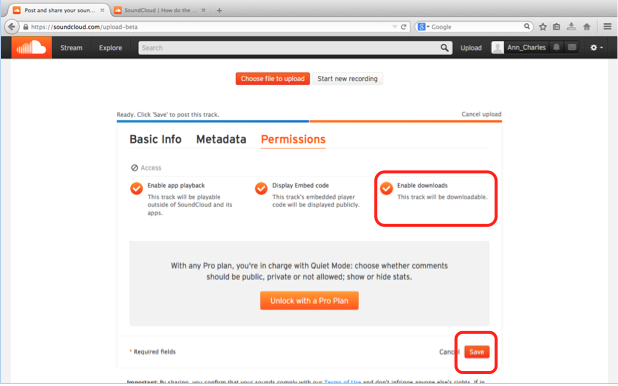 PS As a special bonus, you can download the Soundcloud audio opt-in instructions as a PDF. Just click the link and hit ‘save’ or ‘download’.